Why call on one when we can call on everyone? We are so excited to share with you a wonderful approach to teaching and learning that we are using in every classroom, every day, to ensure that we are working together to make the most out of every moment in school! The approach is called Kagan Structures. 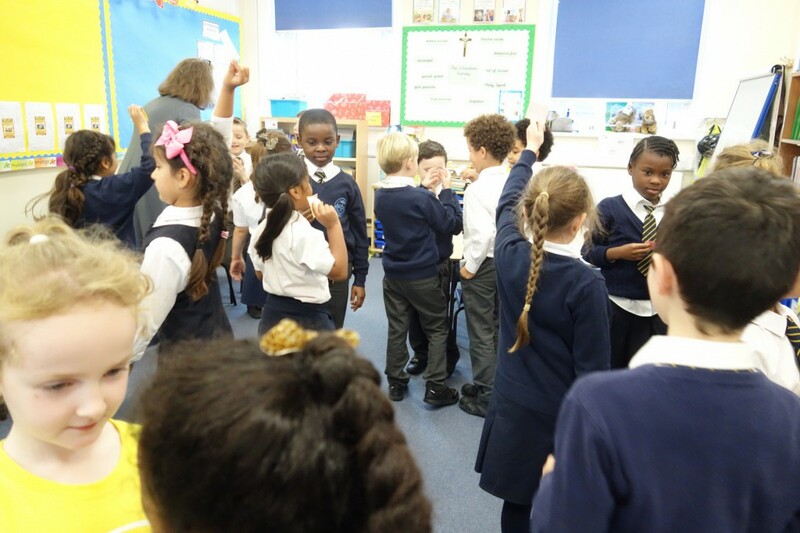 Kagan Structures are highly interactive learning strategies that involve children working cooperatively in pairs and in teams to improve learning and develop essential social skills. Kagan Structures result in so many positive benefits because they create a greater degree of active engagement by all children than traditional teaching. Instead of calling on one child at a time to respond to classroom questions, teachers at Rosary will have children respond in pairs, each taking a turn to share. This way everyone participates much more. Everyone is more engaged and everyone learns more. Instead of practising work alone, children may sometimes work with a partner. Partners have roles so everyone participates, everyone has a supportive coach, and everyone gets immediate feedback. By talking aloud with a partner, children develop deeper thinking on the topic, it becomes more memorable, and they can hear how their classmates think. By structuring learning to be cooperative, children develop cooperation skills, communication skills, and teamwork skills. This results in a safer learning environment, kinder and caring students, and less time off task for me dealing with discipline issues. For teamwork, we won’t just tell children to, “work in your teams.” Unstructured group work often results in some students doing most the work and some doing little to none. We want to every child actively engaged. Kagan’s highly structured strategies ensure every child is actively participating. Children love this approach because they are more active, get to move, talk, and work together. It’s just a more fun and more interactive way to learn. Kagan Cooperative Learning has been the most heavily studied cooperative learning innovation of all time but we are the first school in this borough to start using these Learning Structures. Lots of other schools in Camden have shown great interest in what we are doing here at Rosary. We have had visitors to the school who want to come and see how brilliantly we work as a team and we always welcome anyone who would like to find out more. Watch this space for a video coming soon all about Cooperative Learning Structures at Rosary Catholic Primary School! Please click here for an article on a very simple introduction to the Kagan approach.